The first-ever science-backed Planner for reaching high performance in all you do. 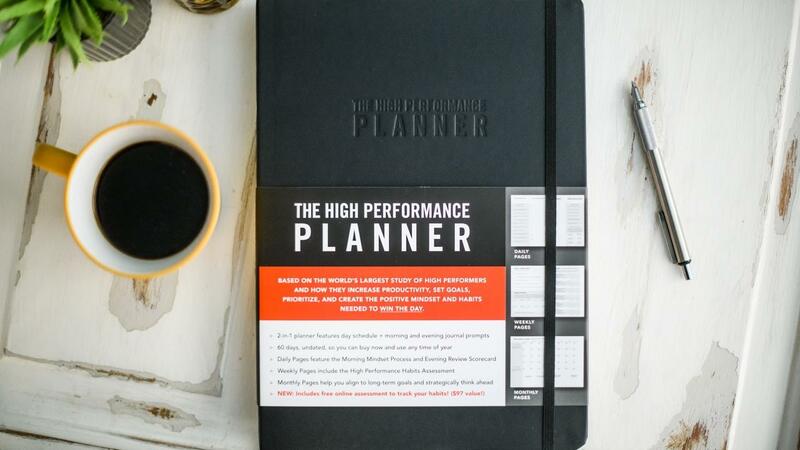 This game-changing gorgeous planner is based on the world's largest study of high performers and how they increase productivity, set goals, prioritize, and create the positive mindset and habits needed to win the day. You'll never feel so upbeat, organized, and on-track to achieving your dreams. 192 gorgeous pages. 8.4"x11.5" executive size only. 60-day planner with 14 pages of graph paper in the back for notes. Due to extremely limited quantities, this order is non-refundable, and only available in All Black. Stay focused every day of the year! Get 6 additional planners when you sign up for a full year pack. Sign up on this page and save 50%. Check the box and we'll add this pack to your order for just just $59! Planners take approximately 2 weeks to be delivered in the United States, and 4-6 weeks to deliver internationally. I also understand I can contact [email protected] for any questions and that this offer is non-refundable because of the extremely limited quantities. We, The Burchard Group, collect your information and can be contacted anytime at [email protected] All of our data use, terms, and privacy information can be found at Brendon.com/terms. You can lodge any complaints with us via that same email, or request to be removed from our email lists, phone lists, or advertising targeting, too.